From the records, the first mention of Jews in Dubrovnik dates to the late 13th century. However first confirmed date comes later on hence it is known that in 1326 there was a Jewish physician in Dubrovnik as the Dubrovnik government offered him a job. It is not known if he did accept the job. Later from mid 14th century it is known that a Jewish physician was employed in Dubrovnik for several years and he was only a predecessor to several prominent Jewish physicians in Dubrovnik. A well known ruling of the Dubrovnik Senate from 1407 allowed Jews to settle in Dubrovnik. After 1492 when Jews were expelled from Spain by Alhambra decree many Shepard Jews and Marranos came to Dubrovnik, or have migrated to Bosnia and other regions under Ottoman rule via Dubrovnik. Some of the new comers even escaped Spain on Ragusan ships as the Republic's ships visited Spain frequently. In 1496 the Jews were expelled from Portugal and even more Jews sought their fortunes in Dubrovnik and the whole Balkan peninsula region. Due to trade disagreements the Republic made a decision to expel the Jews and Marranos from Dubrovnik in 1515. Trade situation in 1532 was such that the Dubrovnik government decided to attract the Jewish merchants to come to Dubrovnik. The Jews who came to Dubrovnik lived mostly in the suburb of Ploce. In 1538 the government allowed some Jews to settle within the city walls. The Synagogue in Dubrovnik dates to roughly to the same time. In 1540 ghetto regulations were set forth, however nothing was organized. In 1545 the houses for the ghetto have been determined and the Jewish community payed tax per person living in the ghetto. Having found security and prosperity in Dubrovnik the number of Jews increased thus the ghetto was extended in 1587. The Jewish cemetery was first mentioned in 1612 when it had to be enlarged. Although the ghetto had been long established several of mostly richer Jews continued to live scattered around the City. In the 16th century we find the first mention of a fountain inside the City walls, the so called Jewish fountain, named so as it was exclusively used by the Jewish community. The Jewish fountain used to be under the Bell Tower, next to the Small Onofrio fountain and after the fall of Republic it was transferred to Brsalje where it stands today and is used for refreshment of many by-passers. Throughout centuries the habitation of Jews in the Dubrovnik Republic was mostly tolerable and in comparison with the rest of the Western cities quite good. The frail relations with the Jewish community was regulated by the government with a fine balance between political interests, contenting the religious fervor of the Catholic church, and sheer trade interests. In the 18th century the Jewish population increased; there were 218 Jews out of a total population of around 6,000. Ragusan archives mention Jewish schools, teachers, weddings, and a Jewish bookseller; Jews participated in maritime ventures as co-owners of ships that went as far as Scandinavia and America, or supplying loans for equipment of such ships; they also played a part in establishing the first maritime insurance companies. With the economic decline of Dubrovnik, however, restrictions were imposed on all foreigners. Jews could not engage in commerce and could only be teachers, physicians, or help in commerce. In 1755 they were again forbidden to live outside the ghetto or to leave it at night. When Dalmatia and Dubrovnik were occupied by Napoleon forces in 1806 Jews attained legal equality for the first time. However, when the Austrian Empire got hold of Dubrovnik in 1815, legal equality was again withdrawn. Jews were finally granted legal equality under Croatian law in the mid-late 19th century. During the II. world war Dubrovnik was occupied by The Italians, who, as opposed to Ustashe regime, did not allow mass deportations, hence many refugees from other parts of Yugoslavia went to Dubrovnik. At the bidding of the Germans, in November 1942, the Italians interned all Jews in Gruž and on the island of Lopud, near Dubrovnik (about 750 persons). In June 1943 they were transferred to the big Italian internment camp on Rab in northern Dalmatia, together with most Jews from the Italian-occupied territories in Yugoslavia. During the brief interregnum in 1943 between the capitulation of Italy and the German occupation, most of them were transported by the partisans to the liberated territory on the mainland. Some joined the Jewish battalion formed on Rab, and others served as physicians or nurses. The 180–200 Jews who could not leave Rab were taken by the Germans to extermination camps. 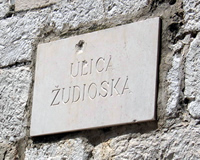 Today, the old Sephardi Synagogue can be found in the street called "Žudioska ulica" ("Žudio" in Dubrovnik speech - Jew - Jewish Street). The street connects directly to the Placa street (Stradun) and looks like any other street in Dubrovnik. In ghetto times, the alley was closed at the top. At the lower end, near the sign Zudioska ulica ghetto access was controlled by a gate - now gone. The synagogue is located in a three-storied baroque stone building to the left of the street entrance. High windows, ogee-arched at the second level, cut the undistinguished and essentially unchanged stone facade. The Dubrovnik synagogue is the second oldest synagogue in Europe, second only to the old synagogue in Prague. It is also said to be the oldest Sephardic synagogue is use in the world. A narrow flight of stairs leads directly to a place where entrance tickets to the museum sell for a token fee. The walls hold old photos and documents, including a list of the earthquake victims of 1667, a picture of the Western Wall in Jerusalem, and many more items related to the Jewish history in Dubrovnik. More steps lead up to the sanctuary. A dominant bearing partition, pierced by three wide arches, divides the room and the oversize bimah into front and back areas. 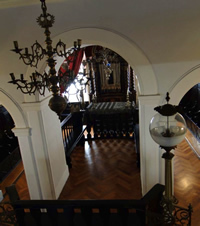 Between 1652 and 1670, the synagogue was redecorated in Baroque style. To replace the women's seating, formerly in a row at the rear, a raised gallery was added at the south wall by incorporating a room from the third floor of the adjacent building. A decorative latticework separates it from the prayer room below. Men sat on high-backed benches along the north and south walls. The synagogue is not big and the size was probably adequate for Dubrovnik's Jewish community, whose numbers between the 16th and the 20th century never exceeded the 260 affiliated persons in 1830. A tasteful white satin parokhet (curtain) covers the inlaid doors of the exquisite Baroque aron kodesh (Ark). The Ark holds several Torah scrolls, one of which may have originated in Spain before the 1492 expulsions. In Sephardic fashion, chains carry bronze Florentine memorial lamps containing glass oil cups in front of the Ark. Heavy maroon velvet drapes form a dramatic baldachin above the Ark and deck the windows. The most important work of art held at the Synagogue is a 13th century Moorish carpet presumably brought from Spain during the expulsion. With floral design it glows with contrasting colors against the dark silk background. Legend claims that it was a gift from Queen Isabella to her Jewish doctor when he was forced to leave Spain. 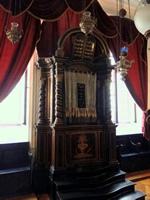 Another valuable possession of the Synagogue is the Torah which is said to be from the 13th or 14th century. It was brought from Spain after the expulsion. We welcome you to explore the history of the Jewish community in Dubrovnik by joining a Jewish Dubrovnik Tour with a licensed Dubrovnik guide. This specialty Dubrovnik tour takes you on a magnificent thousad year journey to experience the life and legacy of Jews in Dubrovnik. For more information on Jewish tours in Dubrovnik visit: Jewish Dubrovnik Tours and choose beween a walking or shore tour. According the 2001 census there are 17 Jews living in Dubrovnik today.